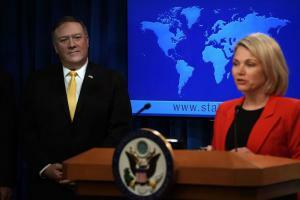 WASHINGTON, DC, USA, December 9, 2018 /EINPresswire.com/ -- The American Mideast Coalition for Democracy fully supports President Trump’s pick to replace UN Ambassador Nikki Haley, the intelligent and capable Ms. Heather Nauert. Ms. Nauert has been a first-rate journalist for many years, working at both Fox News and ABC News and covering a variety of national and international affairs. More recently, Ms. Nauert has proven herself very capable of representing the administration as State Department spokeswoman. In this role, she has worked closely with Secretary Pompeo and earned his trust and confidence as well as that of the President. Khorram, himself a Muslim, finds CAIR's silence in condemning terror and not cooperating with FBI totally un-American. AMCD lends its full support to this excellent nomination.